All veterinary preceptees accept the challenges awaiting them at various externships, but Christina Mathis has pursued more of these learning opportunities than most. 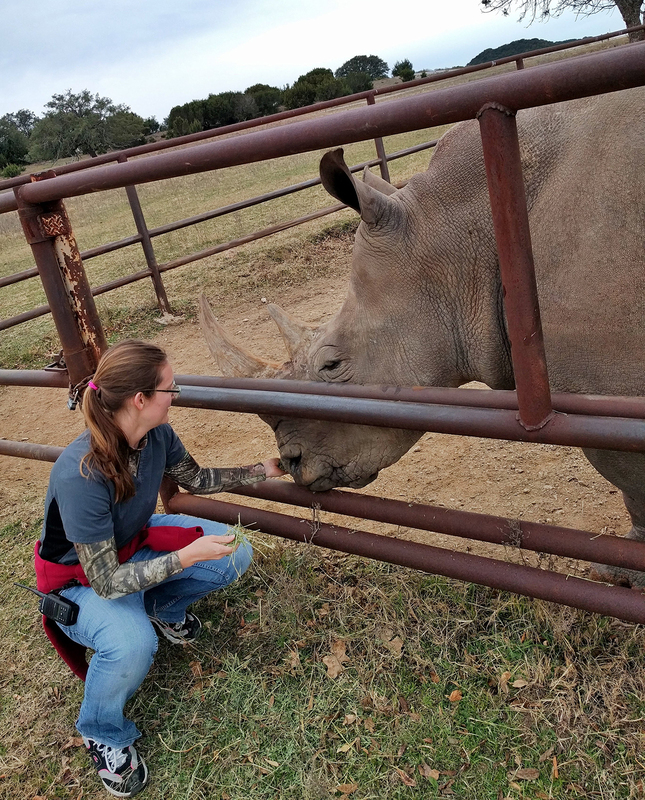 Veterinary Preceptee Christina Mathis really enjoyed her six weeks at Fossil Rim, and interactions with the white rhinos were a big part of that. The native of Wrangell, Alaska was at Fossil Rim from Nov. 5 to Dec. 12. She majored in biomedical sciences at Texas A&M for her undergraduate studies and is set to graduate from veterinary school at A&M in May 2019. Mathis explained how she was in position to accumulate nearly three dozen externship experiences. Many preceptees have been recommended to seek out Fossil Rim, but her own investigation drew Mathis to the Somervell County facility. While she was here to learn first and foremost, Mathis was quick to say how much fun her time at Fossil Rim had been. It seems the Fossil Rim preceptorship differentiated itself from the long list of other externships she has accumulated. “Animals here are taken care of differently compared to all my previous externships,” she said. “They are more like wild animals, in that they are left to do the things they are naturally supposed to do. I didn’t really know what to expect, so I had to make these observations once I was already here. Mathis reflected on some standout experiences she will recall decades from now. “The number one thing that stands out is ‘Blake’ the white rhino calf,” she said. “He was actually my first encounter with the rhinos here, and he made a very good impression. He is my favorite animal here without question. ‘Xena’ (the white rhino calf) is cute, too, but she has a bit of an attitude. “Mostly what I did with Blake is distract him so that he didn’t bother the vets while they did a procedure on an adult rhino that was having her foot cleaned daily. Also, not to be morbid, but I really enjoyed performing the necropsies. We had one on an Attwater’s prairie chicken that I was able to do myself. 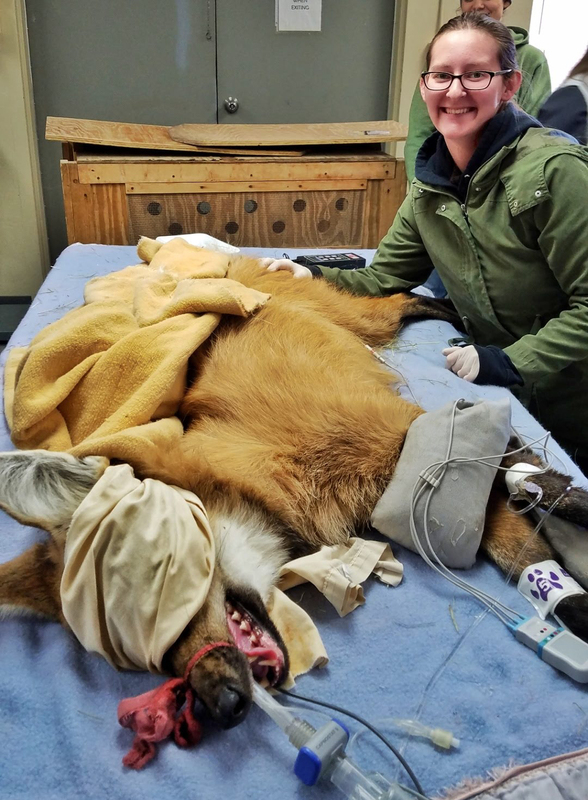 Veterinary Preceptee Christina Mathis helps with the annual wellness exam, imaging and blood work on the maned wolf “Fiona”. Mathis appreciated how easy the carnivore staff was to work with. On that note, Mathis appreciated being able to learn from multiple departments. “I really enjoyed working with the carnivore staff,” she said. “We did a lot of cheetah and red wolf care, and all three of them are really nice. I worked with Justin often (for hoofstock), and he was very good about walking me through the steps during an immobilization. “The veterinary staff was a pleasure to work with. They were really good about targeting my weaker areas and helping me improve. We talked a lot about drug protocols. With graduation mere months away, Mathis knows where she wants her journey to lead. Just as a preceptee would hope, Mathis pointed to specific experiences at Fossil Rim that should benefit her as a professional. 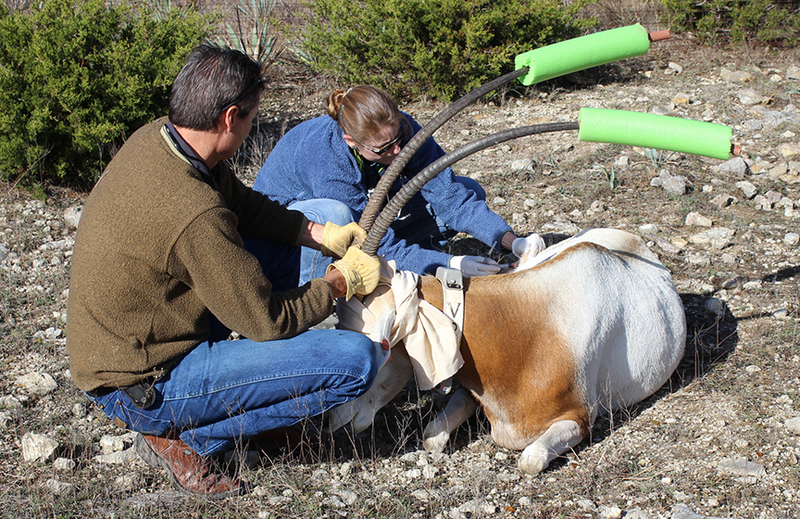 There may have been a few externships over the past four years that Mathis would not recommend to another aspiring veterinarian, but Fossil Rim definitely is not one of them. As a former “civilian” visitor to Fossil Rim, Mathis also offered a tip to future first-time guests. “They need to feed the giraffes; put that at the top of the list,” she said.